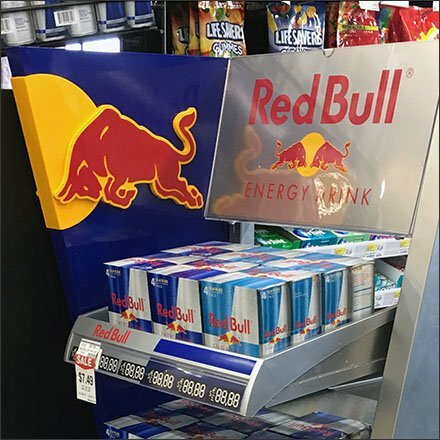 Why sell a single Red Bull, when you can merchandise and sell a Red Bull Grab-N-Go 4-Pack at Cashwrap? And why would a customer pass by a display that offered a massive infusion of energy vs a single shot? This display on the run-up to the cashwrap gives a last minute opportunity for energy-boost-to-go. See from various angles in the gallery of images and note the Red Bull red bull as attention compeller prominent in the side views. This Red Bull Grab-N-Go 4-Pack at Cashwrap seen at Food Bazaar, Cliffside Park, NJ.